Bollywood Celebs Had A LIT AF Diwali And These Pics Are Proof! Home Entertainment B-Town’s Diwali Celebrations Were An Absolute Pataka And These Pics Are Proof! 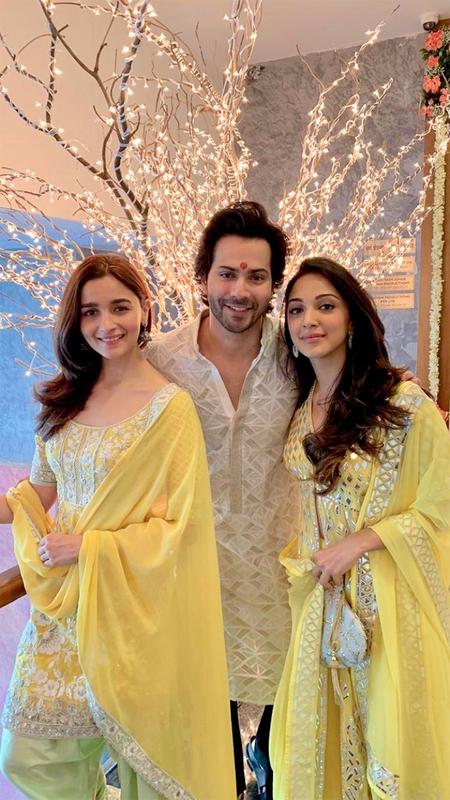 B-Town’s Diwali Celebrations Were An Absolute Pataka And These Pics Are Proof! The festival of lights ushers in the proper party season, with rangolis, card parties, and desi fashion galore! 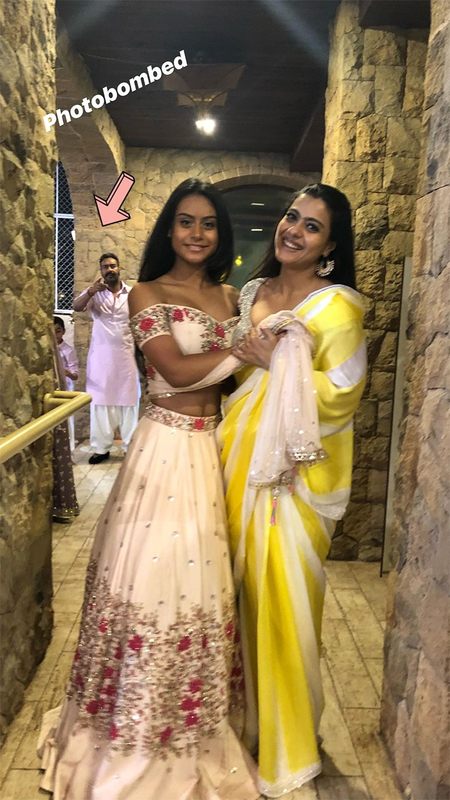 It’s also that time of the year when you’ll spot your favourite Bollywood and television celebs coming together, flaunting their desi designerwear, and lighting up your Instagram feeds with major FOMO from their Diwali parties! We’ve already witnessed some major star power at SRK’s Diwali bash and Shilpa Shetty’s as well. Here’s some more glimpses into the fabulous Diwali celebrations of the stars! The Bachchans posed for some perfect Diwali photos together! Doesn’t Aaradhya look super adorable? Akshay Kumar and Twinkle Khanna’s Diwali was kaafi awesome too! Virat Kohli and Anushka Sharma’s Diwali portrait under a canopy of lights was simply beautiful! Speaking of our other favourite Bollywood-cricket couples, here’s Zaheer Khan and Sagarika Ghatge sending out Diwali wishes! And one more! Harbhajan Singh, wife Geeta Basra and daughter Hinaya are all smiles! As if Katrina Kaif could be anymore breathtaking, here she is lighting up our news feed with that diya and her look! The Khans had a wonderful Diwali celebration at Arpita Khan Sharma and Aayush Sharma’s! Shahid and Mira Kapoor’s Diwali was filled with loads of light and love, as they posed for some adorable pictures! We wish we could’ve had a glimpse of little Misha and Zain. But Mommy and Daddy sure made up for it with a pataka of a picture! Look at that bhabhi-devar love, y’all! Our desi girl Priyanka Chopra was back in the Bay for Diwali after painting the streets of Amsterdam red, white and bride with her bachelorette squad! Check out her pictures with her mom and brother as they celebrated Diwali! 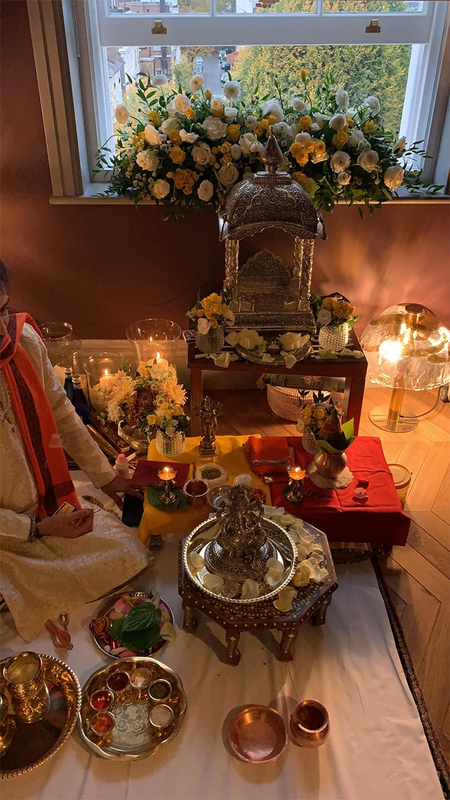 Another set of Kapoors were celebrating Diwali in London with the Ahujas! Rhea Kapoor shared these picture of parents Anil and Sunita Kapoor, sister Sonam and jiju Anand Ahuja and the rest of the fam as they got ready to catch a show of Hamilton! Here’s a video of the Kapoor-Ahujas chillin’! 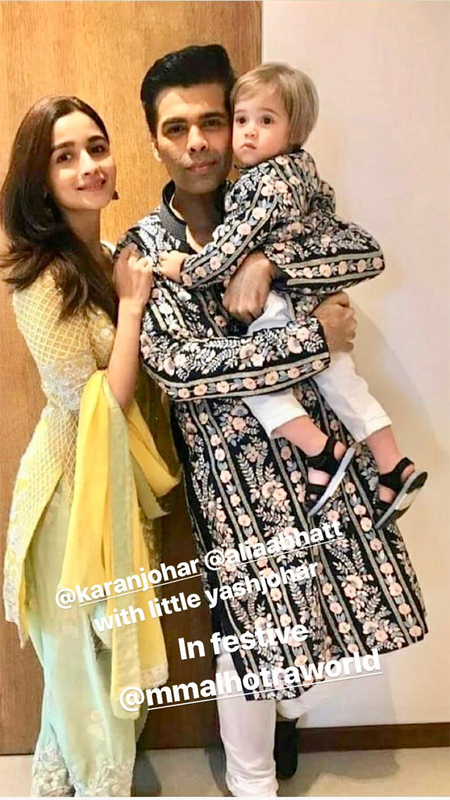 There was a puja at Sonam and Anand Ahuja’s place, and the fam was there! Shilpa Shetty and Raj Kundra’s Diwali bash also had some major star power in attendance! Ekta Kapoor shared a picture of these bevy of beauties from the party, and we spot Shilpa Shetty, Shamita, Sanjeeda Sheikh and Jacqueline Fernandez! The Queen K of TV, Ekta Kapoor also threw a Diwali bash, and of course the who’s who of Bollywood and television fraternity was there! From Mona Singh, Karishma Tanna, Krystle D’souza and Anita Hassanandani to Shabana Azmi, Karan Johar, Kiara Advani, Anusha Dandekar and Karan Kundra, this party was LIT AF with stars! Aren’t Divyanka Tripathi Dahiya and Mouni Roy looking absolute stunners? Wondering what the Pataudis were upto? Saif Ali Khan, Kareena Kapoor Khan and Prince Taimur were spotted out and about with family! Kareena Kapoor was basically scorching hot in her Diwali #OOTN! Check out these photos of Bebo and Saif with Karisma Kapoor, Amrita Arora and their usual squad! And then the Queen B decided to drop this hot new photo and our hearts just went kaput like a sutli bomb! 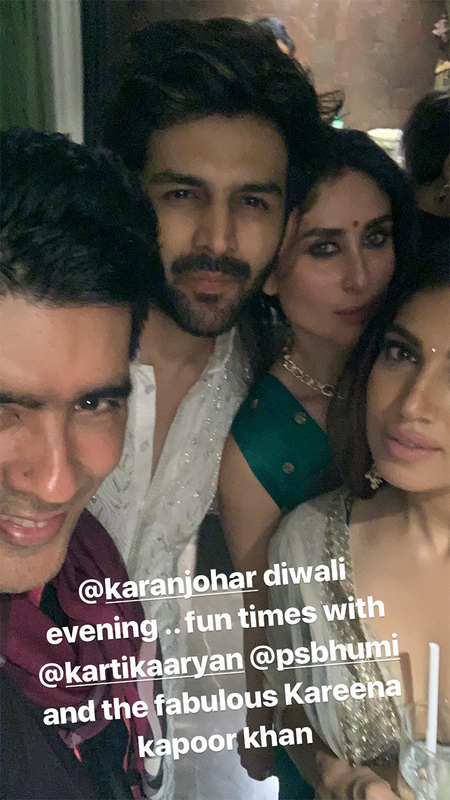 And here she is, stunning again with fellow stunners, Kartik Aaryan, Bhumi Pednekar and Manish Malhotra! Soha Ali Khan and Kunal Kemmu’s Diwali wishes were made even more adorable with daughter Inaaya’s presence! When Karan Johar has party, you don’t need lights because so many stars definitely be shining bright as hell! KJo’s pictures with his twins, Yash and Roohi, are simply the cutest! His other babies, from the film industry of course, were also present! Former student Alia Bhatt posing with the net gen of students! And Varun Dhawan’s lovely picture with girlfriend Natasha Dalal! 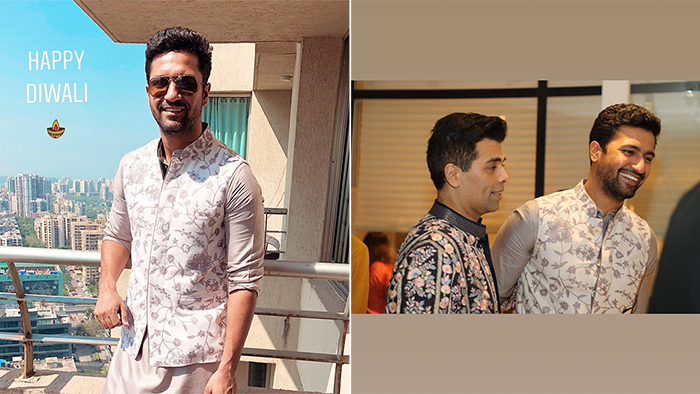 The handsome Vicky Kaushal blessed us with a Diwali look! And this picture with KJo! Raveena Tandon also shared some photos of all her fav bacchas from KJo’s party and we spotted Shraddha Kapoor, Ananya Panday, Anshula Kapoor and Shanaya Kapoor looking pretty! Sushmita Sen’s Diwali was a warm family affair with her daughters and boyfriend Rohman Shawl! Kajol and Ajay Devgn’s Diwali photos are super cute too! 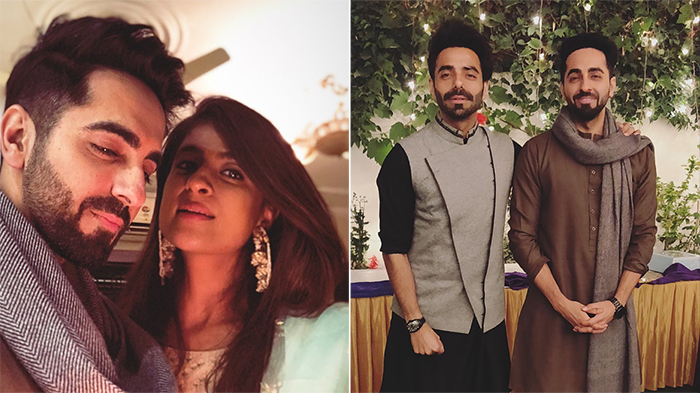 The current Box Office king Ayushmann Khurrana had a fun-filled Diwali scene with wife Tahira Kashyap and brother Aparshakti Khurrana! Sonali Bendre also shared these sweet pictures with hubby Goldie Behl and son Ranveer from New York! While everyone was out there attending parties, our favourite soon-to-be married couple Ranveer Singh and Deepika Padukone were on a wedding-card distributing spree! They were spotted visiting Sanjay Leela Bhansali’s and Farah Khan’s for the same! Farah even shared some fun photos with her ‘babies’! Awwwww! Look how she’s called Baba her son-in-law in the caption! All in all, this has been a tremendous Diwali for the stars! And, of course, here’s the best Diwali wish of the lot, from the biggest, loudest, and most livewire pataka of them all!